best in M@ shopping: Reproduction or Knock-off? It’s the first of m@ shopping of 2013! Check out this reproduction round miniature of Madame Vigée LeBrun’s maternal portrait of ‘Toinette and her children, sans painted-over cradle. Unfortunately if you’re currently in the market for 18th Century miniature reproductions, this one got away! Exactly what purpose does a center table serve? Is it the converse of side tables or end tables? It’s 29 inches high. Too high to be a sofa-side tea/coffee table. It’s nothing what I’d imagine a dining table looking like in Versailles. But the thematic furnishings don’t stop there. There’s a set of Louis XVI-style dining chairs, unfortunately they don’t go with aforementioned Center Table. At least their purpose is obvious. There are at about 10 different types of French buttrests for sale this week: Louise Seize-style benches, a Moustache armchair to a pair of Fauteuils and a Beregère whose upholstery must feel like floating in velvet marshmallows. All this décor eye-candy is labelled “vintage reproduction,” a term that must be an oxymoron, n’est-pas? 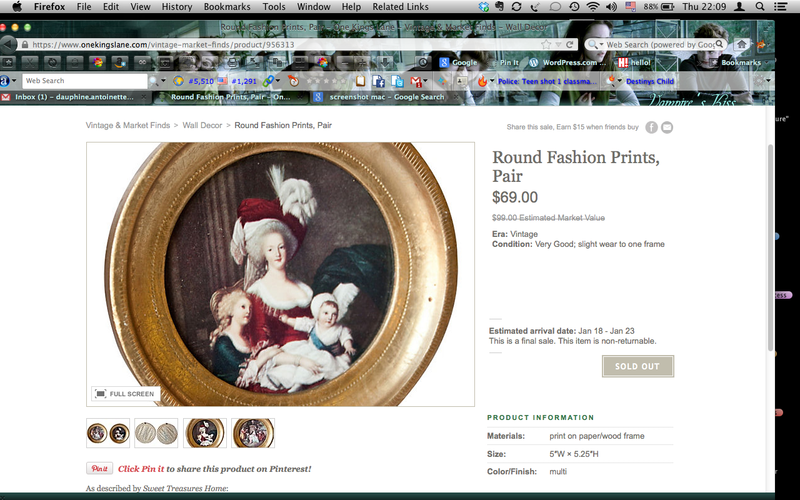 The exact definition of what makes a piece “vintage” is null. The hefty price-tags these vintage-repros sport is what bothers me. $7000 for a reproduction? The Beregère, made between 1910 & 1950, is $1000 (plus shipping). The Fauteuils were made in the same era, with nappy upholstery peeling and rough-edged frames cost over $2000. These are supposed to be steals! I know there aren’t enough “reals ones” to go around but am I the only person who thinks imitation versions shouldn’t cost thousands? A seven thousand-dollar vintage-repro? Double contradiction. What is a reproduction essentially? A knock-off. If you had stacks and stacks of cash, would you spend thousands on used furniture that was a knock-off even when it was new? This entry was posted in best in marie antoinette shopping, marie antoinette and tagged marie Antoinette, Shopping. Bookmark the permalink. 2 Responses to best in M@ shopping: Reproduction or Knock-off? I think I’d have to be a tad bit loony to spend that much money on “imitations”. Good to see you back, was wondering what happened there. Hadn’t seen any new posts in some time. oh you know…that black hole called Christmas at my parents! It’s good to be back! Happy New Year! What’s even funnier is that they’re USED imitations! Suckers!